Perhaps best visited without the kids…..but children are very welcome! 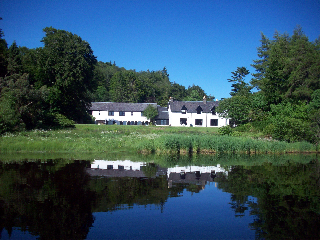 This hotel is a former winner of “Most Romantic Hotel”, Taychreggan Hotel is a stunning haven of peace nestling in its own bay on the shores of glorious Loch Awe. The hotel lies at the end of a seven mile single track lane where you find yourself pausing to give way to fearless Red Deer in no hurry to get where they’re going. Then, as you order your glass of wine and wander down to the hotel’s private jetty or the lovers’ bench out on the promontory – the only sounds you will hear are wildlife and the gentle murmurings of fishermen chatting half a mile away out on the Loch… So this place is probably best for older kids then, though children are welcome. Taychreggan is pure escape. All of the bedroom suites enjoy breathtaking views down the length of the Loch with barely a sign of human habitation. Standard rooms look back towards the woods. We stayed in a junior suite which was a good size, with a comfortable bed supplied with complimentary sherry (although this reviewer may have preferred a single malt…) and a superb bathroom and shower. The restaurant also overlooks the Loch, but you may well find the pleasures on your plate rivaling the views. The Taychreggan Restaurant has 2 AA rosettes and offers up a delightful array of fresh local produce – which starts with some imaginative and fun little appetisers such as the fish, chips and mushy peas (Just one bite of each- but oh so crispy and tasty). I had Inverawe Smoked Salmon with Quail Eggs & Caviar to start, a lemon sorbet, Roast Rack of Lamb followed by cheese selection and coffee with petit fours. The lamb was among the best I have ever had. (Fixed Dinner Menu: £44/head) The following morning we enjoyed a first class Full Scottish Breakfast and didn’t need to eat again until supper! We left feeling very warm and contented after our couple of days away. Taychreggan feels like a rather grown up hotel but staff are friendly and welcoming to children of all ages although it may be better suited to older children or less noisy younger children than we have! On this visit we didn’t take advantage of the hotels full range of optional activities – but there is masses to do. Taychreggan provides a free fly fishing lesson for all guests and boats can be rented by the hour or day. A host of other country sports are available including air rifle shooting, archery, clay pigeon shooting, falconry, ferreting and stalking. Beginners welcome. Other things to do in the area include the Scottish Sea Life Sanctuary, there is marvellous hill walking, various island boat trips and Argyll’s Gardens such as Arduaine.